Some people believe that veneered chess boards are somehow better for the environment than solid wood chess boards, presumably because they use less protected hardwoods in their construction. This can be regarded as a myth. There are so many other factors affecting the environmental impact of a chess board, it is much more complex than the simple veneer / solid debate. Chess Boards come in a variety of styles, from silkscreened slabs of wood right up to huge ornate pieces of craftsmanship with decorative inlays. Of course, all chess boards have the same number of squares and should always be in the same configuration. Solid wooden inlaid chess boards are the most expensive chess boards to manufacture. This is because most of the visible area of the board is made from thick chunks of solid hardwood. Often seen as the most luxurious style of chess boards due to the sheer amount of expensive hardwoods included in the board. The solid wooden boards are constructed using a large square piece of birch ply, usually from Russia. Without this centre core of ply it would be impossible to stop the board from warping in extremes of temperature. Around the edges of the ply thick pieces of solid hardwood are glued and pinned. This then forms a tray into which the solid wooden squares can be laid, one by one. Once the whole board has been laid out it’s usually covered in paper then sandwiched in a press to compress the squares into the tray. Once the glue is dry the surface of the board is sanded to achieve a smooth flat playing surface. The board is then lacquered and usually flocked with soft material on the base. 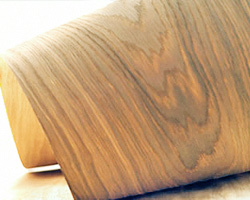 Veneer chess boards are much more suited to mass production. Rather than the board being thick chunks of solid hardwood the boards are essentially plywood or MDF with a thin veneer of hardwood applied to each of the six surfaces. Veneer boards are less expensive than their solid wooden counterparts because they use much less of the deluxe hardwood in their construction. Another reason they are less expensive is because this reliable construction method is much more consistent, so wastage and defects tend to be a lot less. Manufacturing veneered chess boards does allow for a lot of variety and creativity within the design of the board. Intricate inlays and distinctive border patterns are possible without too much cost being involved. 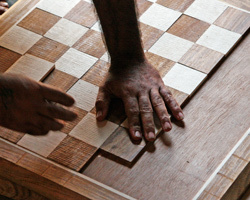 Some manufacturers make extremely fine luxury chess boards using the veneer method. By using thin veneers of woods such as ebony and walnut it’s possible to craft superb chess boards with an excellent finish.